On the one side Orient, neither ethereal nor nostalgic. A bristling, vivacious shore today, fed by an ancestral tradition constantly reinvented. On the other side, an energetic, nonconformist string quartet, as familiar with the finest repertoire (Crumb, Ligeti, Scelsi…) as with unusual encounters beyond expected borders (Albert Marcoeur, Anne Bitran, Fantazio, Moriba Koïta…). Four musicians who question their time in its diversity and from every angle. The Festival de Chaillol builds a bridge between these two shores. The challenge: sharing timbres, practices, and searching for points of contact between both cultural areas. Or how can Arab heterophony be submitted to a western harmonic treatment? How can the classical quartet rediscover its modal memory? The etymology of Al Khatib’s name touches the written and the spoken (katib ‘the writer’, khatib ‘the preacher’). It coincides precisely with this audacious and risky wager. Because can one be sure the encounter will be fruitful? Both parties are fond of adventure(s) and used to listening to the Other. This taste, this desire, already ensure a moment of pleasure. 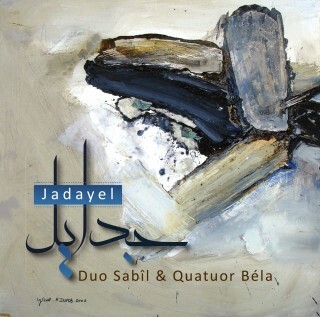 CD supported by Qattan foundation.